A little amount of appropriately prepared powder is poured in water polluted with phenol and cellulose. A bit of the sun and after fifteen minutes harmful compounds disappear, and the powder can be filtered off and reused. Sounds like a fairy tale? Perhaps, but it is not magic, only a masterly use of chemistry and physics by researchers from the Institute of Physical Chemistry of the Polish Academy of Sciences in Warsaw. Many areas worldwide are affected by the problem of growing water pollution by wastes from wood and paper industries, including cellulose and phenol derivatives. 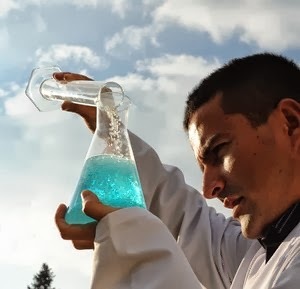 Removal of these agents from water can be easier in future due to low cost and easy-to-produce photocatalysts developed by Dr Juan Carlos Colmenares' group from the Institute of Physical Chemistry of the Polish Academy of Sciences (IPC PAS) in Warsaw. Catalysts are substances that participate in the chemical reactions, speed their courses and (almost) fully recover after the reactions are completed. In typical catalytic processes the catalysts must be activated at high temperatures, typically of several hundred degrees centigrade, often at a significantly increased pressure. The photocatalysts designed and synthesised at the IPC PAS are much less demanding. They are activated by solar or UV light, and the actual chemical reaction can take place at a temperature of about 30°C and under normal pressure. Such conditions naturally occur in many places on Earth. The crucial component of the new photocatalysts is titanium dioxide doped with small amount of iron or chromium atoms. All these materials are commonly available and cheap. The photocatalysts are deposited on appropriate supports – silica grains or zeolites (aluminosilicates) – using common laboratory equipment: a rotary evaporator and an ultrasonic bath. "Ultrasonic irradiation of a solution containing precursors of titania and chromium or iron generates microbubbles of high pressure and temperature. We can manage these conditions and prepare nanocomposite materials which are very stable", explains Dr Colmenares. Chromium or iron doped catalytic materials so prepared have been studied and characterised in detail at the Institute of Physical Chemistry of the PAS and by the Prof. Krzysztof Kurzydłowski's research group from the Faculty of Materials Science and Engineering, Warsaw University of Technology. How do the new photocatalysts clean water? In laboratory conditions the process takes only 15-20 minutes and consists in pouring powder with photocatalyst in water. Then, short exposure to solar radiation is sufficient to make disappear water polluting cellulose or phenol derivatives. Silica supported photocatalysts turned out to be particularly effective in phenol removal, leading to a high degree of phenol oxidation and yielding water and carbon dioxide as the reaction products. Zeolite supported systems catalysed glucose partial degradation (glucose is a monomer, and thus a basic "brick" forming cellulose polymer chains) resulting in formation of, e.g., gluconic and glucaric acids, important carboxylic acids used in food, pharmaceutical and cosmetic industries. What's particularly important is that the analyses performed by Dr Colmenares' group clearly prove that there is no release of chromium or iron atoms to water during the entire cleaning process. After the reaction is completed, the photocatalyst can be easily recovered. Due to durable deposition on silica or zeolite particles of relatively large (micrometric) size, it's enough to filter water to get the catalyst back. The recovered powder can be reused, and multiple repetition of the cycle does not significantly affect the catalyst performance. The new catalysts can also be used outside the industry. Coatings manufactured of these materials have sufficient mechanical strength to be used, e.g., as swimming pool accessories. With good solar insolation, water in a swimming pool constructed with the use of such materials would be subject to continuous self-cleaning process. "Essential advantages of our photocatalysts include simplicity of production, low manufacturing costs and convenience of performing chemical reactions under natural conditions. Equally important is that our materials allow to stop oxidizing water pollutants at desired stage and to obtain substances important for the industry", stresses Dr Colmenares.